When a young boy starts to see the future, Cy-Kill wants him to envision one without Guardians. A few years ago, following loss of his sight in an accident, young Sean Roberts develops the ability to see the future. The boy and his mother are kept safe by UNECOM, but that all changes when Sean predicts that the Renegades will be coming to take him away. Though Sean's predictive record is spotless, UNECOM's Major Benedict seems unconvinced and fails to adequately safeguard the UNECOM base in which the Robertses live... and inevitably, Cy-Kill's band of ne'er-do-wells soon turn up and succeed in spiriting Sean away. Taking the boy to their hideout in a lumber yard, Cy-Kill quickly realizes that Sean will not willingly tell him anything, and so begins plotting to abduct the boy's mother in order to "convince" him to share his knowledge of the future. 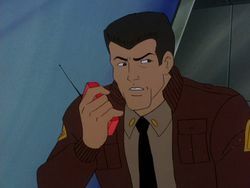 The Guardians are called in to help rescue Sean, and when planetary probes detect a new Renegade base on Saturn's moon Triton, Leader-1, Scooter, and Van Guard set off to investigate, figuring that is where the boy is being held. 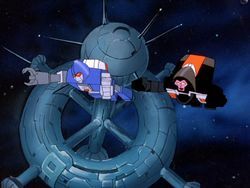 Sean's mother requests to accompany them, but Benedict objects, and Leader-1 agrees; instead, Mrs. Roberts is instructed to stay on UNECOM's space station with Nick, A.J., and Turbo for her own protection. When Leader-1's team reach Triton, however, they discover that the Renegade base is abandoned—the whole thing is a distraction orchestrated by Benedict, who is secretly a Renegade spy! With most of the Guardians away, Benedict deactivates the UNECOM space station's forcefield, allowing the Renegades to launch an attack. 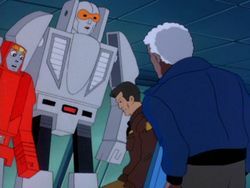 Crasher and Cop-Tur board the station to capture Sean's mother, who surprises Crasher when she demands to be taken to her son. Their mission objective completed with unexpected ease, Cop-Tur decides to take a moment to finish off Nick and A.J., whereupon Turbo comes blasting to their rescue. 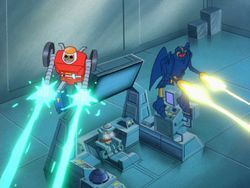 Crasher and Cop-Tur pull out with Mrs. Roberts, and Turbo gives chase; unfortunately, Pincher is lurking outside, and the three villains together manage to overpower Turbo and escape with their human captive. Meanwhile, Sean is able to outsmart his dull-witted Renegade jailer Block Head, darting past him and out into the lumber yard, where the clumsy Block Head trips over the massive logs while trying to give chase and collapses a pile of them onto himself. Sean feels his way out of the yard and through the surrounding forest, but his progress is slow; in his absence, Cy-Kill and the other Renegades return to discover he has escaped, and set out to track him down. As morning dawns, Sean finds his way to a road, and flags down a passing motorist for help... but unfortunately, the blind boy does not realize the "motorist" is Crasher in vehicle form! Crasher takes Sean back to the lumber yard, where he is reunited with his mother for scant seconds before Cy-Kill fires a mesmerizing ray from his eyes that saps Mrs. Roberts of her free will. Afraid for his mother's safety, Sean agrees to share his visions of the future with Cy-Kill, but when he has trouble describing what he sees, Cy-Kill hooks him up to the mind-reading Brainstormer so the Renegades can view the images for themselves. Sean's vision shows the Guardians arriving in the lumber yard and being defeated, so Cy-Kill, confident the future will bring victory, orders the Renegades to launch another attack on UNECOM in order to lure the Guardians to their doom. Exposed as a spy, Major Benedict is arrested and taken to UNECOM Base Seven for interrogation by General Newcastle and Leader-1's returned team. Benedict refuses to give up any information, fearing for his life in the event that Cy-Kill should find out—a fear that suddenly seems very justified when Crasher, Cop-Tur, Pincher, and Block Head attack the base! Cop-Tur snatches up Benedict while Block Head and Crasher amuse themselves chasing Scooter, but when Turbo and Van Guard gang up on them, they decide it is time to withdraw. 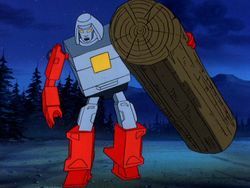 Benedict realizes his "rescue" is all a ruse when the villains deliberately deactivate Thruster's stealth device, successfully tricking the Guardians, who think it is damaged, into following the craft back to the lumber yard, to the fate Sean has foreseen for them. As soon as they arrive, the Renegades fulfill Sean's visions: Crasher clobbers Turbo with logs, Van Guard is lured into a pit and buried in cement by Block Head, and Cy-Kill, Pincher, and Cop-Tur all gang up on Leader-1, delivering a combined blast that looks to be fatal. 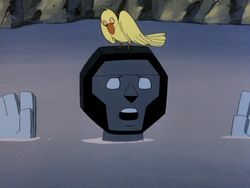 Unfortunately for the villains, what they fail to realize is that Leader-1's "dead body" is just another of Scooter's ever-tricky holograms! Thinking his old foe is finally no more, Cy-Kill tries to coerce Sean into making more predictions, but Mrs. Roberts shakes off the Renegade leader's mind-control long enough to tell her son not to listen. 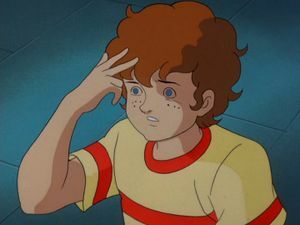 Cy-Kill mesmerizes Sean's mother a second time, but it's too late; Sean refuses to look into the future, so Cy-Kill throws the Brainstormer into full power to force the images out of the boy's mind. The image that appears on the machine's screen, however, is that of the still-living Leader-1... seconds before the Guardians' Command Center violently smashes into way into the building! Cy-Kill threatens to overload the Brainstormer and kill Sean, forcing the Guardians to stay their hand... but after the rest of the Renegades have withdrawn, Cy-Kill sends the device into overload anyway! The repentant Benedict comes to Sean's rescue, shutting the machine down, and the Renegades are forced to flee. Sean is unharmed, but discovers that the overloading Brainstormer has stripped him of his precognitive power. Knowing that the loss of this abilities means the Renegades will no longer have any interest in him, the Guardians take him and his mother home... though a little glimpse into the future might have helped them realize they forgot to pull Van Guard out of that cement before they left! "Come onnnn, little boyyy, talk to Uncle Cyyy. I'm your paaaal." "You don't sound like anybody's pal!" "TELL ME THE FUTURE, YOU DISGUSTING LITTLE WRETCH!" "I didn't talk! I swear!" "One more word out of you, and I'll crush you like an egg...Benedict." —Cy-Kill is genuinely witty sometimes. This episode features the first appearance of Renegade concrete mixer Block Head in terms of broadcast order. 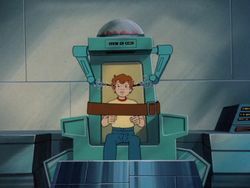 Like many other characters, though, his chronological first appearance will later come during the "GoBotron Saga" mini-series, which takes place before this events of this story. Cy-Kill can fire a mesmerizing ray from his optics which temporarily robs Mrs. Roberts of her willpower (pictured). Scooter uses a hologram of a defeated Leader-1 to fool the Renegades. Scooter fires hand blasters along with Leader-1 and Van Guard when Block Head attacks them as they draw close to the lumber yard, but as we know from "Tarnished Image" and "Scooter Enhanced," Scooter doesn't have hand-blasters. General Newcastle is standing on a balcony while addressing Mrs. Roberts instead of with Matt and the Guardians. As a result, when Benedict runs in to deliver his report to Newcastle, he puts his back to the general and addresses the Guardians as if Newcastle is standing with them and not high up on his lofty perch. The moon of Triton's name is consistently mispronounced as if it's two distinct words, "Tri-Ton". As Crasher menacingly advances on Mrs. Roberts, the whole shot is staged as if it's the end of the scene—Crasher's laughter echoes over a diagonal screenwipe into the next shot, and the background music reaches its crescendo and fades out. But the next scene is... just a shot of Thruster shooting at the space station from outside, which lasts all of four seconds, before things cut back to Crasher and Mrs. Roberts again. When Crasher, Cop-Tur, and Pincher fly off to board Thruster, the background painting of space doesn't change between shots, making it look like Thruster just pings into existence after the trio flies offscreen. Pincher's monster head is colored blue instead of gold on his chest when Cy-Kill is threatening Sean and his mother. The grey portion of Cop-Tur's chest is blue when he's watching Sean's visions on the Brainstormer. When Cy-Kill orders the Renegades off on their mission to "rescue" Benedict, Pincher responds "Yes, Cy-Kill!" 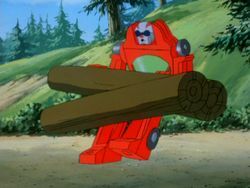 but Cop-Tur is animated as speaking the words, with Pincher himself nowhere onscreen. 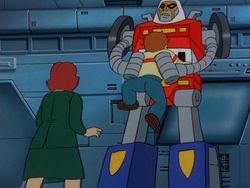 After Cop-Tur stuffs the "rescued" Benedict into his chest compartment, there's a metallic "clunk" that indicates the compartment's supposed to close over, as it normally does when any GoBot pulls this trick, but no cover appears, and Cop-Tur flies off with his chest still open. Cover your shame! When Scooter scoops up Nick and A.J. to run from the Renegades, they materialize on his scooter seat with the visual and sound effects as if he were making a hologram of them instead. Then later, they vanish when he transforms. So...what happened to the real Nick and A.J.? When Cop-Tur orders Pincher deactivate Thruster's stealth device, both Renegades briefly go "off-model" in ways that make them look oddly more "human"; Pincher gains a nose, and Cop-Tur an "upper lip," which they retain for most of the remainder of the second act. In the very last shot of the act, Pincher's nose is even miscolored gold, when it's been blue in the other scenes. 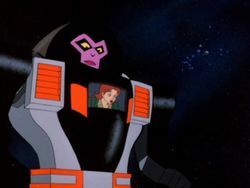 As Cy-Kill activates the Brainstormer for the second time, a circular stain on the animation cel appears above the control panel for a single frame. When Cy-Kill gives Mrs. Roberts a second dose of mesmerizing ray, the animation shows the beams hitting her in the chest, rather than the eyes. As Cy-Kill threatens to overload the Brainstormer, a blue starburst flashes on Leader-1's chest when he radios the others, instead of the entire segment lighting up like normal. When Leader-1 and Turbo pursue the fleeing Renegades, they're obviously supposed to raise their arms, fire their blasters to blow a hole in the ceiling, and then fly out through it... but in practice, what actually happens is that they raise their arms, a blaster sound effect is heard even though no beams are fired, and the pair them fly out through the hole in the ceiling that was already there for the entire duration of the shot. Sigh. The red rectangles on Crasher's chest are missing in the final scene aboard Thruster. As Cy-Kill delivers his final line of the episode, his teeth are white instead of their usual yellow. The treacherous Benedict is, of course, named after famous traitor Benedict Arnold.